It’s no accident that Vancouver, British Columbia, is consistently ranked one of the “most livable” cities in the world. It’s surrounded by exceptional natural beauty. Nestled between the Pacific Ocean and the Rocky Mountains, it’s cooler in the summer and warmer in the winter than the rest of Canada. Also, a strong economy, rich cultural diversity, and solid infrastructure, all contribute to making the city a great place to live and work. Central to Vancouver’s vitality is its port. The tourist that pour in on cruise lines — 1 million passengers are expected in 2019 — are probably blissfully unaware that they’ve just passed through the busiest port in Canada. But not because of tourism: automobiles (400K cars annually), breakbulk (steel, lumber, machinery, etc. ), bulk (grain, chemicals, petroleum, etc. ), and containerized cargo account for the lion’s share of traffic. Worldwide, the Port of Vancouver ranks 47th, according the JOC.com Top 50 list. On this blog nowthatslogistics, we ranked it the 7th busiest port in the Americas region (North and South America combined), based on 2016 numbers. But 3.3M TEUs of cargo in 2017 would move it up two positions, just behind Santos, Brazil. The port generates 115,000 Canadian jobs (49,000 work directly for the port, the balance are indirect and induced jobs), and adds $18.8B to Canada’s GDP, according to a 2016 economic impact study. Last year, the value of the goods handled by the port exceeded $200B. While all ports along the west coast of North America saw growth last year, Vancouver’s growth of 10.9% was one of the highest. The port has become the largest gateway in the Pacific Northwest for Asian goods imported into both Canada and the US. “I think the growth is beyond anyone that has forecasted,” Jack Mahoney, President of Maersk Line Canada, told JOC.com. Several factors have helped Vancouver beat out rivals for market share, such as the Port of Seattle-Tacoma, just 150 miles/240 km to the south. While total terminal fees are less than what Seattle-Tacoma or Los Angeles/Long Beach charge (by 9-26%), lower intermodal rail fees in Canada amplify the savings. Much of the cargo delivered to west coast ports is actually bound for Chicago (a major hub for goods traveling east) and points beyond, where some two-thirds of North America’s population lives. 70% of imports leave the Port of Vancouver via rail, and Canada’s government-regulated railways are generally less expensive and more efficient than their southern counterparts. So being able to save $400 to $600 per container shipped (vs Tacoma or LA/LB) to Chicago is significant. That’s a savings of about 20%! The port also credits its success to short dwell times (usually less than 3 days), infrastructure investments, labor stability, and supply chain transparency. The Port of Vancouver reported another 5% increase in container volume in the first half of 2018: a record 1.64 million TEUs. But rapid growth presents its own challenges. Dwell times of 5-7 days have recently been reported, with backlogs taking weeks and even months to improve. On top of year-over-year growth trends, a mad rush by retailers to import goods before $200B in US tariffs on Chinese imports kicked-in exacerbated the problem across all west coast ports. Add to this delays at ports in China — services from the world’s largest port in Shanghai are frequently 3+ days late — and it’s understandable why shippers are on edge. Last March, the Canadian International Freight Forwarders Association (CIFFA) complained to Canada’s Minister of Transport and its Minister of International Trade, that “inefficient terminal operations hold Canadian traders hostage” and urged the government to accelerate $2B CAD in National Trade Corridors Fund spending. The Canadian government has agreed to review efficiency and security at the nation’s 18 port authorities. The Port of Vancouver has publicly voiced its support for such a review, citing that Canada Marine Act is now 20 years-old. Meanwhile, a $300 million expansion of the intermodal railyard at GCT Deltaport, should provide much needed relief. The yard featuring eight semi-automated cranes finally came online last September (about a year behind schedule), and is in the process of being optimized. Semi-automation will increase the yard’s capacity by 50% to 1.9M TEUs, and will make transferring containers between ships and trains much more efficient. Automation also allows for a continuous flow of up to 30 train switches per day (compared to mid-20s in manual mode), and it makes it possible to increase the yard’s total capacity by placing tracks closer together. Until now, a lack of surge rail capacity has been a choke point for the port. This was especially apparent last winter, when bellow freezing temperatures and mountain pass avalanches caused massive delays along the east-west corridor. Both CN and CP railways have since prepared winter contingency plans, spending $100s of millions of dollars to purchase new locomotives, hire more conductors, and expand network capacity in an effort to regain customer confidence. With the Deltaport railyard expansion, the port should be able to recover more quickly from severe weather disruptions. It will also be better equipped to handle surges caused by the increased use of 14,000+ TEU “megaships”. The increased use of megaships — and the congestion they cause — also has the port testing a novel flat fee pilot program for trucks. Rather than charging peak pricing for daytime hours, GCT Deltaport is charging trucks a flat fee around the clock. This is intended to reduce truck dwell times and congestion at the start of night gate shifts (peak pricing frequently results in long lines of trucks waiting for after-hours pricing). This is great for truck drivers, as it means less waiting and will make it easier for them to arrange pick ups and drop offs in a single call. It’s also a boon to smaller beneficial cargo owners (BCOs) that don’t have the volume to operate around the clock and were thus subject to higher peak pricing. Larger retailers who’s warehouses already function around the clock are understandably less enthusiastic about paying a flat fee. Still, the ability to schedule traffic based on volume and not time-of-day is proving beneficial. Other ports are paying attention, and the Ports of Los Angeles and Long Beach have already announced a similar flat fee structure, pending U.S. regulatory approval. The Port of Vancouver: What Lies Ahead? 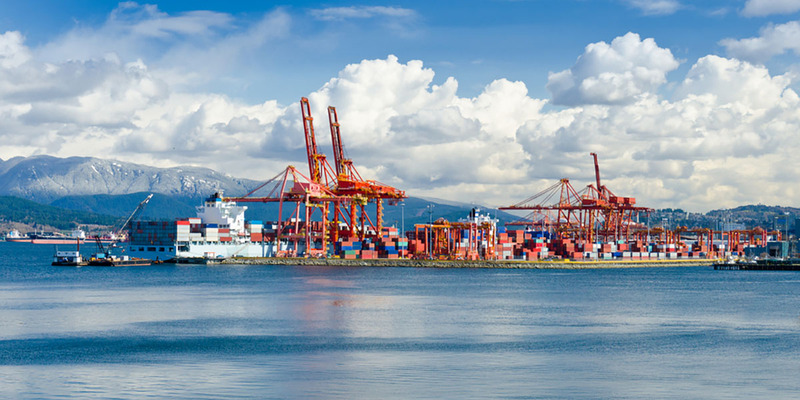 Despite trade wars, NAFTA uncertainty, harsh weather, and the like, all indications are that volume at the Port of Vancouver will continue to increase for the foreseeable future. To this end, a new container terminal at Roberts Bank is planned for the mid 2020s. This terminal will add an additional 2.4M TEU capacity. Additionally, expansion projects at the Deltaport and Centerm terminals will add 1.2M TEUs over the next few years. These projects are crucial to the port’s ability to keep up with demand. Also, the Canadian government has hired Morgan Stanley Canada to investigate the possibility of nation-wide port privatization. Opinions are mixed as to what the impact of such a move might be, positive or negative. Time will tell. One thing is certain: the Port of Vancouver will continue to be Canada’s #1 port for years to come! What’s on Tap at CES 2019?